Veggie Loaded Baked Potato Soup... in the Crock-pot! 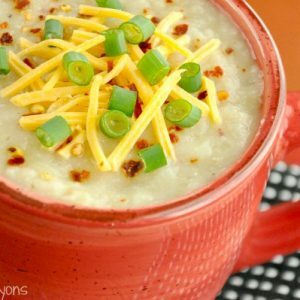 Let your slow cooker do all the work with this thick, creamy, vegetarian loaded baked potato soup! It's healthy, sketch-free and full of flavor! chopped green onion chives work too! Chop your veggies and toss em in the pot! Next add veggie broth, garlic, butter, salt, and pepper. Set your slow cooker to HIGH and cook for 4 hours, or, if you're gone for the day, set it to LOW for 8 hours. After returning to your slow cooker, you have a very important (ok not that important) decision to make. Do you want your soup chunky or smooth? For smooth soup, use a potato masher or even an immersion blender (my tools of choice) to creamify the soup. For chunky potato soup, grab a wooden spoon and mash the potatoes partially. Ready to eat? Simply mix in your cheese, milk, spices, and a spoonful or two of green onions or chives. For a thinner soup, you can totally add more broth or milk as desired; simply add extra seasoning and mix-ins along with it and you're good to go! Give it a taste, add any extra seasoning as desired, toss on some toppings, and dig in! I like adding extra dill and a little more garlic powder! The flavor was spot on and I didn't miss bacon one bit! Success! It legit tastes like a loaded baked potato when you top it with sharp cheddar cheese, sour cream, and green onion - love it so! Using unsalted butter? Season a with a little extra salt, to taste. Nutrition facts below are an estimate provided by an online nutrition calculator. Adjust as needed based on toppings and extras.